We almost did not go to the Mickey's of Glendale shop because I asked Mik if he wanted to go in as we exited the Carousel of Projects and he did not say anything. Then as we were about to leave the Expo I asked if there was anything left he wanted to see/do and he said the Mickey's of Glendale shop, so we went back to it. We were glad we did, but it was not a fun experience. The Mickey's of Glendale shop is very crammed with displays and merchandise. Even without the crowds of people it would barely be navigable with the wheelchair. Add people and we got stuck being unable to go any direction for 5 minutes. I ended up leaving Mik in one stop and looking at the stuff. Luckily, I found a must have pin for Mik's collection that made the whole experience worth it in hindsight. 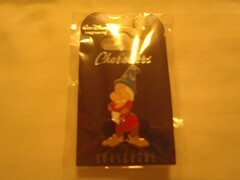 It was a Sorcerer Grumpy pin for Mik's Grumpy (Mik's favorite Disney character) pin collection. It was not fun to be stuck once I came back to him with what we wanted and were trying to get out of the shop, but Mik has keeps bringing up how happy he is to have a new Grumpy pin for his collection, so it was worth the hassle with it being the highlight of the trip for him. The funny thing is when I came back to him and handed him the Grumpy pin, he gave me a weird look like is the pin your getting what about one for me? Sorcerer Mickey is my favorite character (I do not collect every pin, though, as too many feature him) and he thought the Sorcerer Grumpy was a Sorcerer Micky pin. Once he figured out how awesome it was to finally have a new Grumpy pin (its been over a year since he has found one he did not already have), he was speechless until of course he could not stop bringing it up as we were walking to hotel/Disneyland and waiting in line for rides. We both also ended up selecting a Carousel of Projects pin to buy at Mickey's of Glendale. 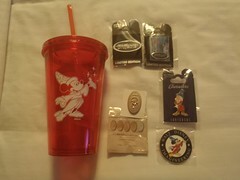 Mik also got a red Sorcerer Mickey tumbler cup and I got a magnet with Sorcerer Mickey and a Smashed Penny Mystery Pin (ended up being the New Year's one and not of interest to me, but maybe another thing I could trade).